“Split 10 inch LP ltd to 210, comes in a silkscreened gatefold cover with colored OBI (white brick red, yellow-orange), insert + postcards… Liner notes by Alan Cummings. 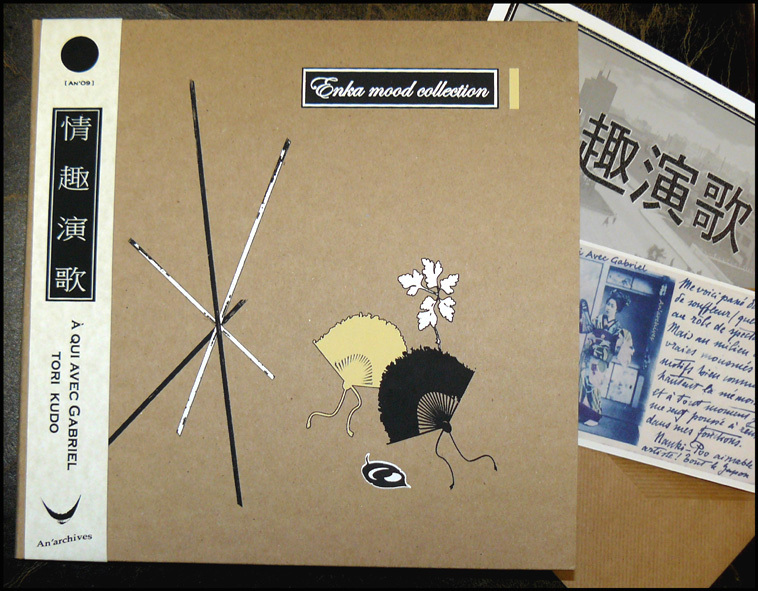 Second in the enka collection series on An Archives after Jojo Hiroshige & Shiraishi Tamio. À Qui Avec Gabriel is an accordion player based in Tokyo who opened her discography with Utsuho on John Zorns label Tzadik in 2001 (featuring Haino Keiji as a guest musician). Since she has collaborated with Makoto Kawabata, Majutsu No Niwa, Mico to name a few. Her stylistic palette is eclectic, drawing on shades of jaunty european folk music, the elegant minimalism of Erik Satie, and uniquely lighthearted melancholia. Here for the first time on record she left her accordion Gabriel for a piano and a seat and proves shes found her own voice as an expressive singer. The other side features Tori Kudo (Maher Shalal Hash Baz and Noise with his wife Reiko Kudo) who has a revered status in the Japanese underground since the late 70s (Taco, Guys N Dolls, Fushitsusha…) but this time he brings listeners into the heart of an amazing and feverish karaoke house with his friends . For those who didnt know it before, maybe for the very first time they are going to discover Tori Kudo as an inimitable & unforgettable crooner, as a true lover of popular songs.” - An Archives. "Side A of this split LP features self-proclained “King of Noise”, Jojo Hiroshige, founder member of the legendary Hijokaidan and stalwart of the Japanese noise scene. The B-side is engraved with the naked and guttural voice of sax-player Tamio Shiraishi, accompanied here by guitarist Malenkov Both sides appropriate the Enka repetoire in remarkablky different ways. Jojo Hiroshiges howled declamations and metallic scoria guitars chisel these old Enka ballads into something more monstrous while Malenkovs flamenco arpeggios bandage torn lace around Shiriashis voice. Shiraishi recorded these songs in Uramado, a small kabuki-cho bar haunted by the ghosts of the Tokyo underground. Wandering through the streets of this floating world, one gets re-acquainted with those long lost voices of Enka. This document is only a superficial incision into the exquisite corpse of the Japanese underground, a body of work where traditional and modern musical lines converge and take their rest, having now been cast into oblivion by the relentless changing trends. Enka music is deeply anchored in Japanese society and still remains influential today among those who frequent Karaoke bars where singing is the preferred language." - An Archives. Silkscreened jackets by Alan Sherry of SIWA. "Side A is another love song between La Grande Dame Junko (one of Japans foremost improvising vocalists and a member of long-running free-noise unit Hijokaidan) & Michel Henritzi (french guitarist and member of Dustbreeders and HowlinGhost Proletarians ). This is blues for the day, from noise to abstract blues, the volcanic meeting between voice and lapsteel. Side B is blues for the night with Michel Henritzi and Fukuoka Rinji (Majutsu no Niwa – Overhang Party) , another sad story between guitar & violin recorded after Fukushima s trauma. Ashes, asphyxiated air, cloudy and melancholic." An Archives. Split LP ltd to 150, silkscreened cover with obi and insert. "Split 10 inch LP ltd to 250, comes in a silkscreened gatefold jacket with obi (blue, pink, brick red) insert + postcards… Liner notes by Alan Cummings. 4th volume in the enka series, were happy to announce the release of this new one : a split with 2 longtime friends and music associates since the late 1990s. Masami Kawaguchi has been an influential figure in the Japanese underground scene for 2 decades, playing with bands such Miminokoto, Broomdusters, Los Doroncos and more recently with his New Rock Syndicate. Hes also known as a major & regular Keiji Hainos collaborator in Aihiyo and more recently in Hardy Soul. Hes one of the greats of modern Japanese psychedelic rock and more recently he recorded the beautiful “The mad guitar sings” album on Black Petal which is a dark solo take on Masamis signature sound, balancing between late night-early morning comedown blues and black luminescent storm-song. On this release Masami covers 2 different songs, delivering a personal & bleak version of a great enka standard (if not the prototype of the enka song) and a fiery cover of a weird and rather unknown song.